Sony will remain in a portion of the 220,877-square-foot Park Ridge building, where it has about 300 workers. PARAMUS, N.J. – As part of an aggressive push to expand and diversify its portfolio of real estate properties Hornrock Properties announced today that it has acquired One Sony Drive in Park Ridge, NJ from Sony Electronics Inc. Hornrock also came to an agreement with Sony to lease back a portion of the space in the building. The deal is indicative of the Paramus, N.J.-based privately-run real estate development firm’s strategic acquisition program. The company has added a significant number of trophy residential and commercial properties in the mid-Atlantic region to its roster over the past several years. Led by Maurice and David Hornblass, Hornrock Properties has implemented a trailblazing investment approach that centers on acquiring value-added assets and executing responsible development and operational practices that fully maximize return on investment. The acquisition brings a 220,877 square foot, class A, headquarters quality building into Hornrock’s growing portfolio of real estate assets. 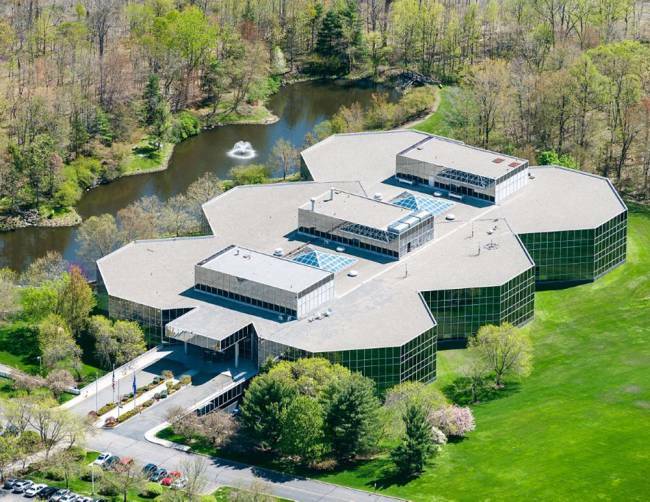 The building sits on 37.2 acres of pristine land located in the heart of upscale Bergen County. One Sony Drive is located approximately one mile from Exit 172 of the Garden State Parkway, approximately five miles from the New York Thruway and 20 miles from New York City. Routes 75, I-287 and 17 are also easily accessible. Hornrock Properties’ growth plan benefits from a balance between its aggressive appetite and a calculated approach towards valuing and managing assets. It also benefits from access to capital, which means the company can opportunistically pursue a wide range of acquisitions. In 2014 alone, Hornrock Properties added two new for sale residential projects totaling nearly 70 homes: Legacy of Mountain Lakes (www.legacyofmountainlakes.com), a luxury townhome community in Morris County, NJ, and Highpointe at Woodbury Junction (www.highpointewoodbury.com), a single-family home community in the historic Hudson Valley. The developer also announced the acquisition of residential real estate in Harrison, NJ that will be home to a 270-unit residential building. Hornrock Properties’ success is rooted in the Hornblass brothers’ entrepreneurial spirit and their family’s 50-year history in real estate development. For more information on Hornrock Properties, visit www.hornrock.com.